TULA, Russia, Dec 7, 2016 – CADSoftTools announced the release of a new version of ABViewer, a program for working with DWG, DXF, PLT and other CAD files and 3D models. 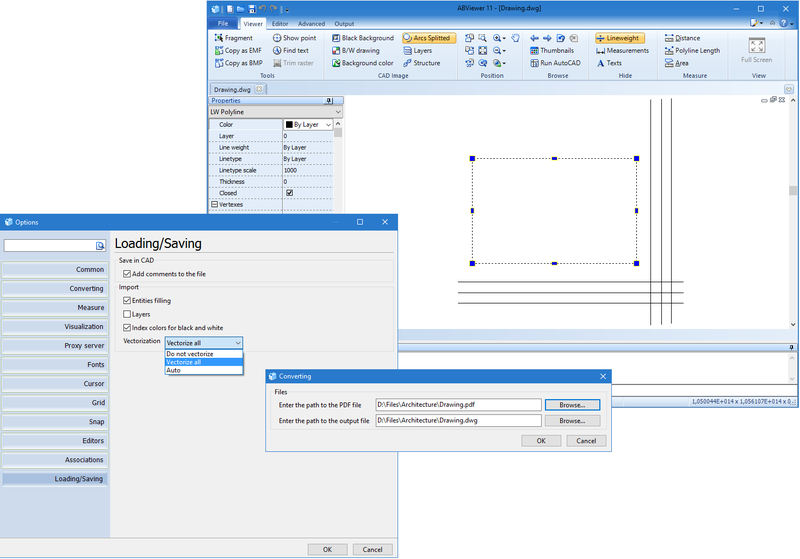 Now the software is capable of converting raster PDF files to DWG. A lot of CADSoftTools clients have already evaluated PDF to DWG converter included in ABViewer that allows converting lines, polylines, hatches, arcs, texts and other entities. Earlier raster PDF files were transformed into uneditable OLE-objects just like in the majority of other converters. Vectorization of raster images is one of the major new features of ABViewer 11.2. Generally vectorization is required for scanned drawings. Now it is possible to convert raster PDF objects into editable vector DWG entities which makes it much easier to work with the transformed drawings. You can vectorize the whole raster PDF drawing, vectorize it partially or transform it into an OLE-object without further vectorization. PDF to DWG conversion is available in ABViewer Enterprise. You can find license prices at CADSoftTools website. Besides, if you already have a license for ABViewer 11 Enterprise, you can update your version free of charge. If you have any questions regarding ABViewer, please write to CADSoftTools at info@cadsofttools.com or visit their website http://cadsofttools.com/products/abviewer/.